"Firehall" redirects here. For the Canadian performing arts centre, see Firehall Arts Centre. "Fireman's hall" and "Firemen's hall" redirect here. For the hall in Alfred, New York see Fireman's Hall (New York). For the hall in New York City, see Firemen's Hall (New York). "Firehouse" redirects here. For other uses, see Firehouse (disambiguation). A fire station (also called a fire house, fire hall, firemen's hall, or engine house) is a structure or other area for storing firefighting apparatus such as fire engines and related vehicles, personal protective equipment, fire hoses and other specialized equipment. Fire stations frequently contain working and living space for the firefighters and support staff. In large US cities, fire stations are often named for the primary fire companies and apparatus housed there, such as "Ladder 49". Other fire stations are named based on the district, neighborhood, town or village where they are located, or given a number. A fire station will at a minimum have a garage for housing at least one fire engine. There will also be storage space for equipment. The most important equipment is however stored in the vehicle itself. The approaches to a fire station are often posted with warning signs, and there may be a traffic signal to stop or warn traffic when apparatus are leaving or returning to the station. If the station is occupied full-time by career firefighters, it will contain living quarters and work areas, where they wait until a callout comes through. Career firefighters are usually able to sleep during a night shift, so these stations will also have dormitories. There will be an alarm system to alert them of an emergency call, and to give some indication of where and what the emergency is. In some small fire departments, the only alarm may be a telephone for receiving calls. Many fire stations were built with the living quarters above the garage. This arrangement is common for fire stations built in a crowded city, and also allows for a raised area to hang hoses to dry to prevent damage. The fireman's pole was invented to allow firefighters to quickly descend to the garage. In modern times, agencies such as the National Fire Protection Association have argued that these pose a safety hazard. Modern fire stations are often built with the living quarters on the same level as the garage. Some fire stations are not regularly occupied, with the firefighting carried out by volunteer or retained firefighters. In this case, the firefighters are summoned to the fire station by siren, radio or pagers, where they will then deploy the fire engine. These fire stations may still have office space for the firefighters, a library of reference and other materials, and a "trophy wall" or case where the firefighters display memorabilia. ^ Newcomb, Tim (23 December 2010). "Sorry, Kids. Fire Stations Are Ditching Fire Poles". Time Magazine. 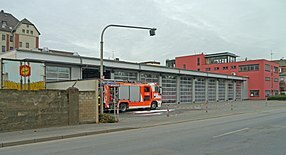 Wikimedia Commons has media related to Fire stations. Look up fire station in Wiktionary, the free dictionary.